Minimum footprint - Maximum display area. Positioning the compact refrigeration module inside the case allows maximum display frontage from a minimum of counter space. This allows you to maximise sales per metre of counter. Products are clearly illuminated by having a daylight fluorescent tube in the top, along with clear acrylic front and sides, this provides maximum impact from the products on display. The self evaporating defrost system means no drain off point is required. Wipe clean, reinforced plastic end panels. 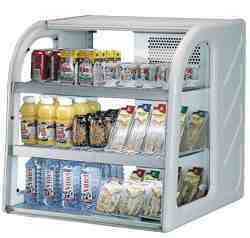 Easily maintained, removable modular refrigeration system. Supplied with 13 amp plug. Maintains cabinet temperature between 3OC & 5OC in ambient temperatures of up to 32OC or 60% relative humidity. Hinged, lift up serving flaps. Curved screen to front, top hinged, can be lifted up for cleaning.